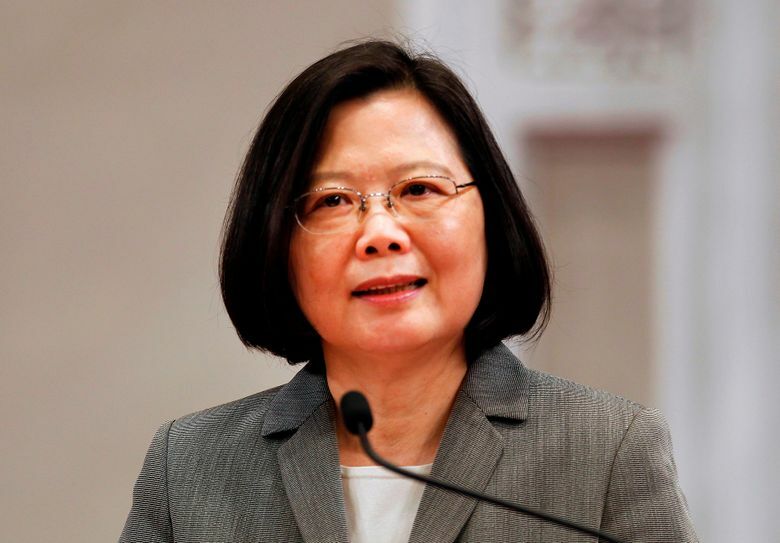 BEIJING (AP) — When Taiwanese President Tsai Ing-wen departs Sunday for Latin America, she’ll be traveling to a region she’s already visited three times in two years. She doesn’t have many other options. As Tsai crosses the halfway mark of her first four-year term, an eight-day swing through Paraguay and Belize is a reflection of how Taiwan’s diplomatic isolation has worsened in the midst of a suffocating Chinese pressure campaign. Just 18 countries — mostly clustered in Latin America, the South Pacific and Caribbean — still maintain formal ties with the self-ruling island, down from 22 when Tsai entered office in 2016. Along with luring away Taiwan’s allies, China, which considers the island its territory, has frozen contacts with Taipei and sought to constrict its contact with international organizations. It’s also bringing increasing economic pressure and most recently has browbeat international airlines and businesses into referring to Taiwan as part of China, a move condemned by Taipei and its ally, the United States. Still, maintaining even a reduced pool of diplomatic allies is important to maintaining Taiwan’s image of itself as a sovereign democracy, and affords its leadership with the occasion to assert their presence abroad. Tsai will also be transiting in Los Angeles and Houston, providing opportunities to meet with overseas Taiwanese civic leaders and American officials. Although Tsai leads Taiwan’s Democratic Progressive Party, which favors declaring formal independence from China, she has pursued a moderate China policy since taking office. But that hasn’t appeased Beijing, which has demanded that Tsai explicitly acknowledge an informal 1992 agreement that recognizes Taiwan as a part of China. Faced with Beijing’s diplomatic onslaught, Tsai has prioritized cementing its ties with remaining allies and backers like the United States and Japan, with which it maintains close relations in the absence of formal diplomatic ties. At the same time, she’s facing a dip in her domestic poll numbers, possibly, Sullivan said, due to a combination of Chinese pressure in the international arena and disappointment in her reform agenda at home. On her trip this week, Tsai will attend the inauguration of Paraguayan President-elect Mario Abdo Benitez and address the National Assembly in Belize. China has traditionally moved carefully in Latin America, which it sees as falling under the U.S. sphere of influence, but has scored wins by flipping Panama and the Dominican Republic in the last 14 months at Taiwan’s expense, said Zhu Songling, a professor at the Institute of Taiwan Studies at Beijing Union University. The Dominican Republic ditched Taiwan in May after it refused to match a multi-billion-dollar aid package offered by China. Flavio Dario Espinal, an adviser to the Dominican presidential office, told reporters in May that “socioeconomics reality now force us to change course” and embrace China, its $2 billion-a-year trading partner. Tsai is increasingly coming under fire from her political base for her moderate approach to China, which has not ameliorated Chinese pressure.